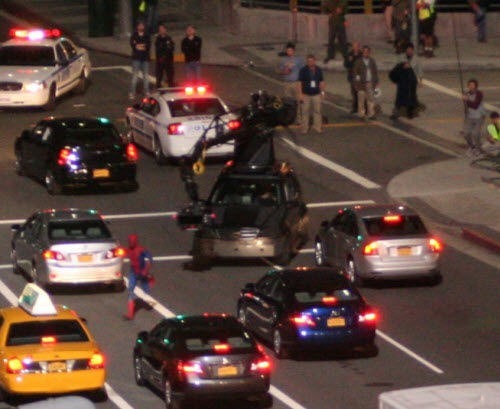 Been a while since anything related to the Spider-man reboot, Amazing Spider-man was posted, so here are a few photos taken from the set, along with a video. I’ll admit, the costume is warming up to me, it seems like we’re getting a bazillion new costumes between the comics and this movie that, so right now, I’m pretty happy to see red and blue! Still not sure how I like the golden looking lenses, rings back to the Spider-man Unlimited cartoon, that fact itself might be the one thing holding me up from really liking it, but we’ll wait and see it in action, there is always a chance it’ll look cool. Its finalized! The new Spider-man movie’s title is the one most were hoping for The Amazing Spider-man! 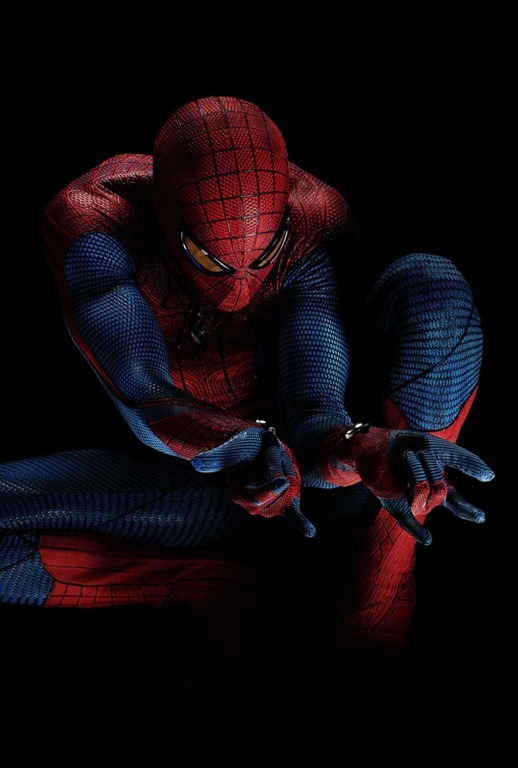 The title was announced today simultaneously with announcing the movie’s new official website TheAmazingSpiderman-movie.com. Along with those announcements, we get an official close look at the costume, with full mask (boots are hidden though in shadow). My only question is, are the lenses actually yellow tinted, or is that from the angle of the picture released? 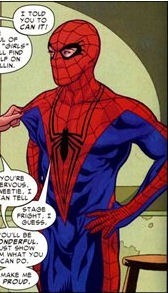 I will say though, I like how the webbing looks on the mask. Check the picture out below. Including first good glance of the spider emblem on the back, and a closer look at the boots. 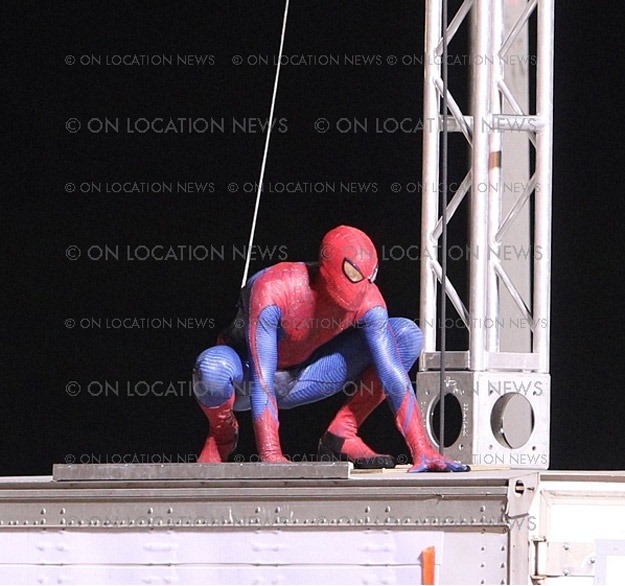 Comingsoon.net has posted some close-up shots of the new Spider-man costume from the filming in LA from On Location News. These new shots give us a clearer picture of the mask, the back of the costume and the boots. After looking at these pictures, it appears that the webbing is somewhat raised or at least reflective from the shots, especially from the lighting on the mask. We have our first real glace of the spider emblem on the back of his costume, or the lack there of, as it appears they’ve just duplicated the black spider emblem from the front rather then have the classic red emblem help break up the solid blue of the back. (Hate this change) We also get more looks at the boots, and they continue to look like they are wrestling boots to me. I’m still up in the air on this costume. Some of the simple changes I was able to live with, like the red down the leg, but taking out the red spider emblem from the back? 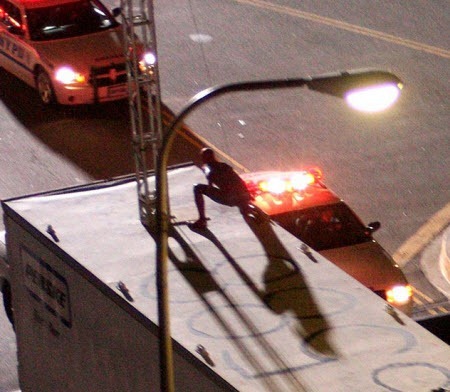 That takes away one of the more iconic images of Spider-man. When he’s swinging away from you, you see that big red spider on his back, and now with this new costume, you no longer have that. Out of all the changes they’ve made, I think this is the biggest mistake thus far. Check out a few pictures below, and check out Comingsoon’s coverage from the link above. 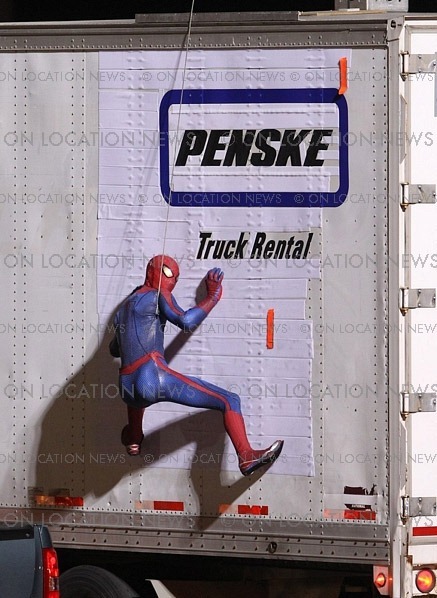 Below is a collection of some of the photos that have popped up online this week from the Spider-man reboot currently filming in LA. If nothing else, I have to say that the shots of Spidey swinging, really begins to sell me on at least the action sequences that this film will have. Lets continue to hope for the best! If anyone comes up with additional photos, feel free to post below, and we can week a running collection. 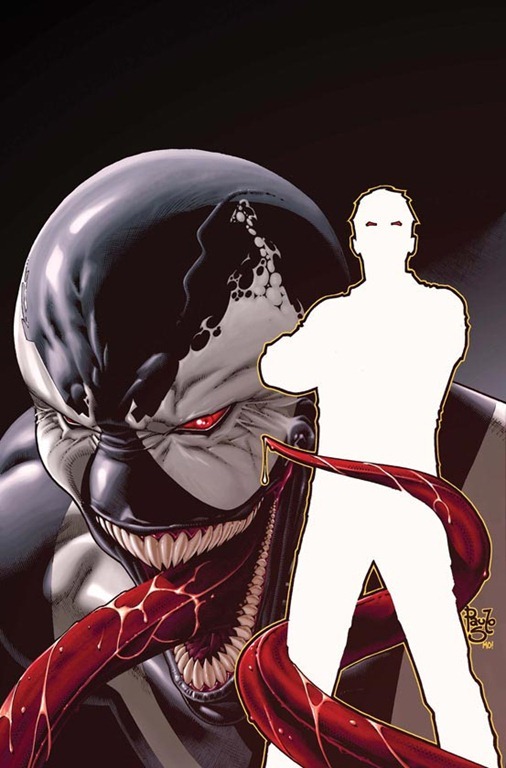 Spoilers: Who is the NEW Venom? In an interview that Newsarama posted today that they conducted with Rick Remender and Marvel senior editor Steve Wacker, its revealed that Venom’s new how will be (highlight) Flash Thompson! Guess if its true and not a red herring, we’ll be seeing how it plays out soon enough! My only hesitation is that in the one cover we’ve seen, the hidden person is standing, while most will know that Flash is currently a double amputee. Guess its possible that with the symbiote he regains his legs in some fashion? Check out the full article and interview at Newsarama plus some new interior pages here. Spider-man’s costume: Is it actually the wrestling suit? While doing some late night web surfing, I came across something over in the forums of Superherohype.com, where the user Majik1387 posted some scans from the Spider-man miniseries Spider-Man: With Great Power from ‘08, which covered the period of time Peter was a wrestler prior to Uncle Ben’s shooting. Within that miniseries, we get a look at a Spider-man suit which he wore while he was a wrestler, and unless you picked up the miniseries, you’ve probably not seen this suit before. (Left) Look familiar? Have to admit there are large similarities, especially the lack of the belt and the red going down the legs, even the size of the eyes on the mask It could be argued that Marc Webb could have used this look as inspiration for the suit we’ve been seeing online the past few days. If he didn’t though, that is one heck of a coincidence. Beyond just that though, there are other aspects that point to this being his wrestling suit. (Whether it’s the suit he wears through the entire film can’t be determined either way) You also have to take into consideration that this is a reboot, along the same vein as Batman Begins was for the Batman franchise. One would think, that with the success that the revitalized Batman franchise has enjoyed it would get the people at Sony, and Marc Webb to want duplicate a few of the finer aspects of what made Batman Begins and The Dark Knight so successful. One of those being that they were tied down and based on the real world. When you saw Bruce Wayne put together the first Batman outfit, along with the new one in the 2nd film, there were real world reasons behind it and how he put it together. It wasn’t just in one scene Bruce Wayne has decided he wants to fight crime and the next he shows up in a recognizable latex suit. We the audience saw the progression, and it could be argued that this is part of the reason for what we could be seeing in the upcoming Spider-man movie. Remember, the film’s timeline is based when Peter is still in high school. What normal teenager would have the ability, much less the resources to put together what we know as the classic spidey suit. He still has the powers, and believes that “With great power, comes great responsibility” so the easiest way for him to be the hero he needs to be, is to use a suit already in his possession, a suit he wore wrestling. If you take the basic concept that you need to relate things to the real world, then this gives more credence to the concept that we’re seeing the Spider-man wrestling suit, rather then the Spider-man superhero suit. 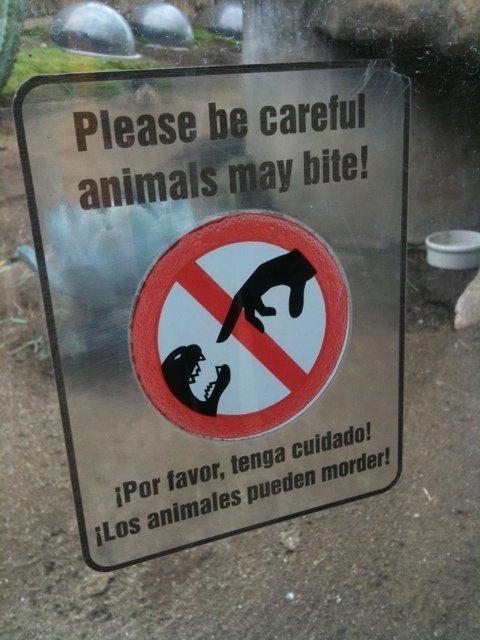 Another sign pointing to this? Yet another photo has surfaced, and this one, gives a very clear picture of the foot, and it can clearly be seen that the silver we’ve been seeing, at first thinking it was something like a tennis shoe, to then being metallic, to now, looking like something leathery. Not only that, put you can see that there is red that has the same type of sheen as well. Hard to argue that they match up pretty well isn’t it? So its easy to accept that these could in fact be wrestling boots. Not only that, but the idea of him wearing a wrestling costume gives reason as to why he’s in such bright colors, along with wearing what looks to be some form of gloves. So, what does all this mean? For me, if this is the case, it gives me a little bit more faith in the film. If Marc Webb is actually using comics as the base material, granted it’s a miniseries that was printed under the Marvel Knights imprint and isn’t considered cannon, he is still basing it off material already out there, so it can’t be blamed for that. Plus, its giving real world purpose to not only the suit, but the evolution of the suit. 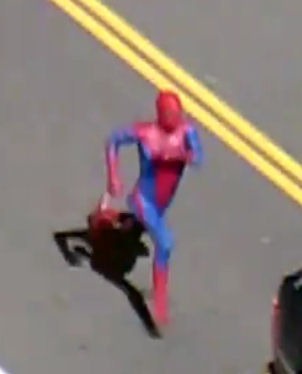 In the original Spider-man movies from Sam Raimi, we see peter wrestle in sweats and a ski mask, turn around and we suddenly see him in this fairly sophisticated suit, and have no explanation how a kid, who was wrestling for money because he was broke, turns around and finds the resources to create the suite. I can handle using the Batman Begins equation for the explanation and evolution of the Spider-man costume. For me, I hope what we’ve seen so far is in fact the wrestling suit. If it is, I can even handle seeing it through the entire movie. There is purpose and reason for why we would. Why would he make his own suit while he has this perfectly good one to use. 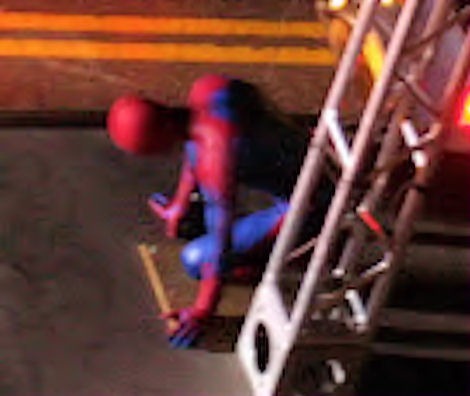 Could even be something where the suit is thoroughly trashed in the final battle scene, where we could see the classic suit, or a closer version of it in the next film. Bottom line, for now, I’m under the belief that what we’re seeing is Peter Parker wearing his Spider-man wrestling costume, and that eventually, maybe not till the next film, we will see the more iconic Spider-man suit. 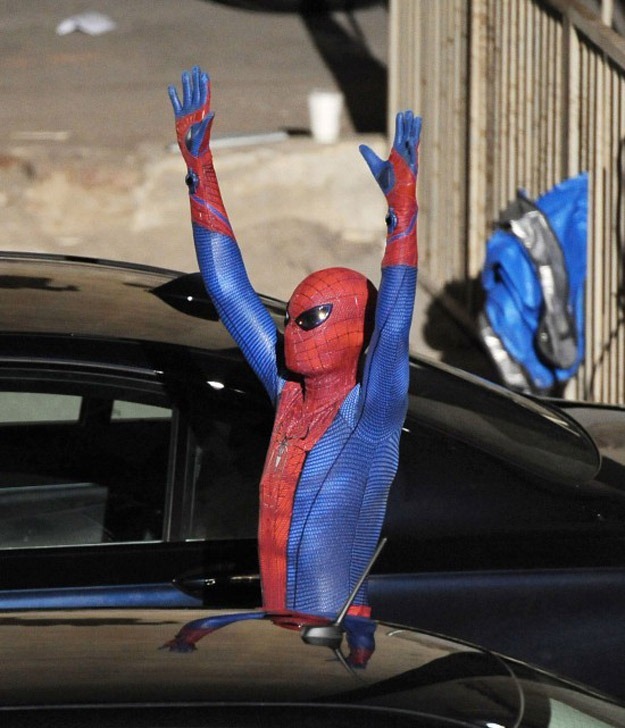 I realize the last few days I’ve been posting and tearing this suit apart, but now, looking at it this way, gives me a little more faith in Marc Webb. 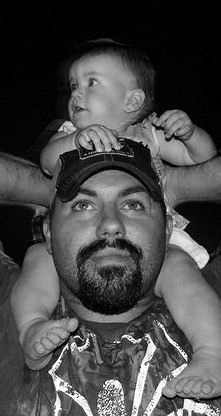 At least enough to where I can sit back and say I will wait and see what the final product is before I judge anymore. Check out Superherohype’s forum, and the discussion about the Spider-man costume and additional pictures and scans here. Even more Spidey pics, showing WHITE lenses!! 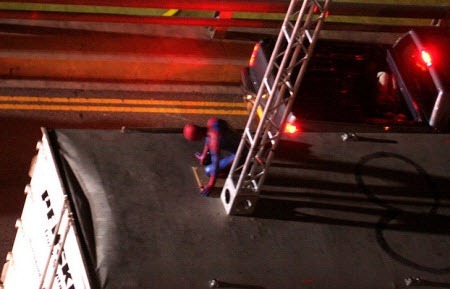 The site Perez Hilton has grab another new picture of the new Spider-man suit from the filming in LA the other night. This photo seems to contradict what was seen in the latest, in that the lenses are clearly white (thank god!) along with a clear shot of the foot, which no longer looks like he’s wearing shoes, but has some type of metal brace or something that appears to come around from the heal and the arch of the foot. Unsure if this is for the stunt suit or if this is part of the actual suit we will see. And what’s going on with the “boots”? Looks like there might be a web pattern on the front part, but to me the calf looks somewhat strange. Also not feeling the lines going down the legs in the blue portions. Just feels like unneeded extra to me. 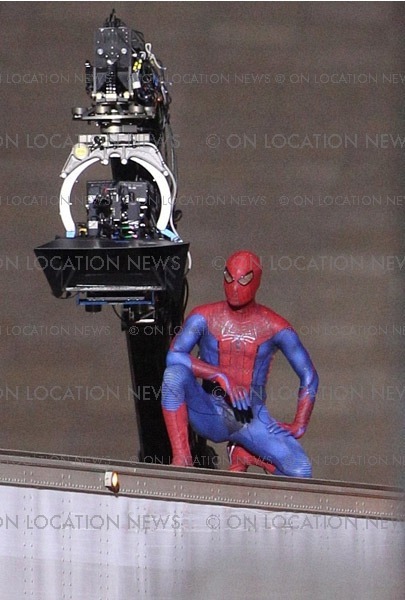 Hopefully after all these leaked photos and video’s Sony will soon release another shot of the suit, showing the full redesigned suit to end all speculation. Find all images on the original Perez Hilton post HERE. Agree with me? Disagree with me? Leave a comment below. Oh No! 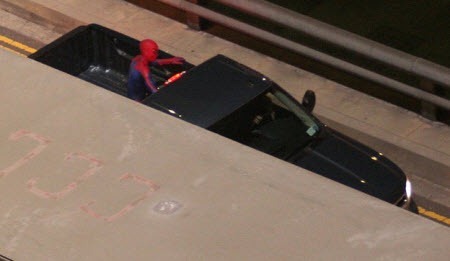 Spider-man’s costume?! And the Mask?! 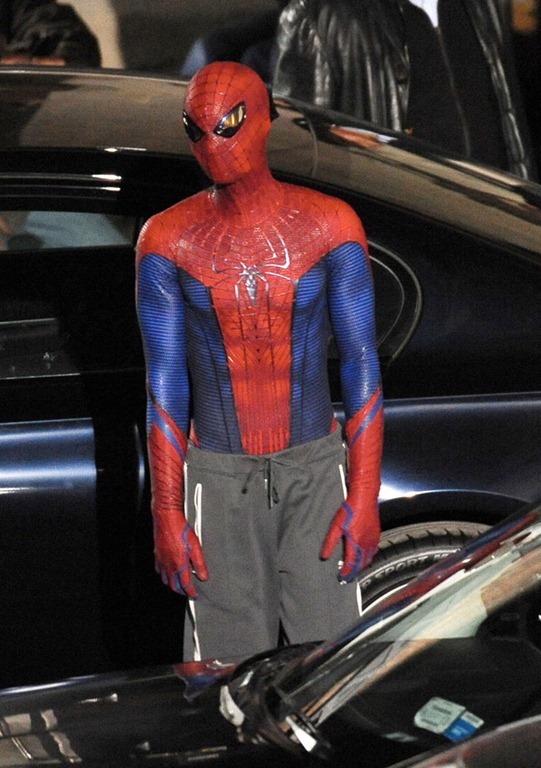 MTV’s Splash Page has released a clear shot of the new Spider-man suit from the reboot. I’m sorry, buy my first reaction to this is that the mask makes me think of the old Japanese Spider-man show where he had a Power Rangers like robot. I love the fact that he has web-shooters (yes I’m sticking to that belief until told otherwise). I’m hoping small things like the red lenses and what looks like tennis shoes are just elements for the stunt suit and not actual elements of the actual suit that we’ll see, but at this point, with all the liberties they’ve taken with the suit already, who knows. I had been optimistic with all the blurry shots up to this point, keeping faith that the look of the mask would win me over. For me, its failed. I’m a huge Spidey fan, and to me, this isn’t Spider-man. Check out Splash Page with a few close ups of the mask and web-shooters, and below for the opening to the aforementioned Japanese Spider-man show. After the videos and pictures that came out yesterday, Comingsoon.net posted a new video of the same scene but slight closer and different angle. That video has given us a couple more looks at the new costume. From the pictures above, we can see that the “belt” comes around from the back and down the side and back of the thigh. The red also seems to extend down the back of his arm to the elbow. Is it possible we could have some sort of symbol beside the classic spider symbol on Spider-man’s back? One that extends down the arms and legs? Check out our other recent Spider-man posts. 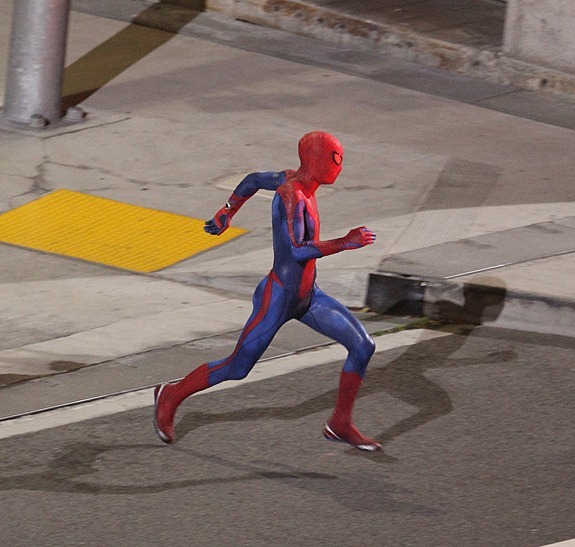 Web Shooters confirmed in new Spidey photo? 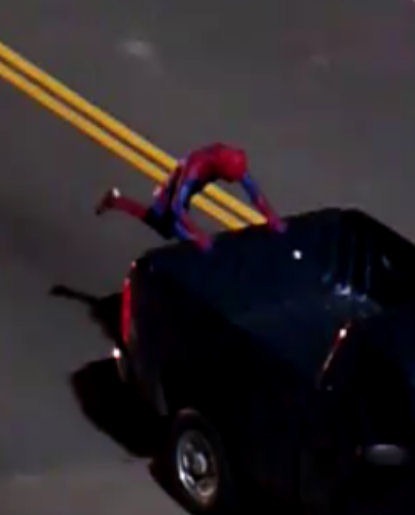 Okay, these have been all over the web today, where people caught a glimpse of some filming going on in LA, where Spider-man is running through traffic to jump into the back of a moving pickup. First off, I’ve seen people ask why is he running and not swinging. Well, if you go by the basis that he is using mechanical web shooters (like me) then you’ll probably expect at some point for him to run out of web fluid, and if you’re Spidey without web fluid, what’s the next best chance to get somewhere? 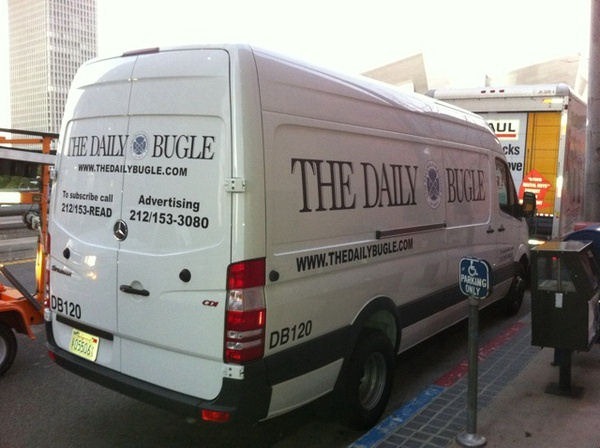 Here are some other shots that have popped up on the web, including a Daily Bugle van, and a sign possibly hinting to something related to the Lizard.